Acetal Copolymer is also know under the following trade or brand names Delrin, Tecaform, Ultraform, Celcon. As well as Acetal brand names it also know as the following industrial names including polyacetal, polyoxymethylene (POM), which is a high performance engineering polymer. Acetal is available as a homopolymer (POM-H) or copolymer (POM-C). This engineering plastic is a semi-crystalline thermoplastic that gives high strength, hardness and durability. It has a number of highly desirable properties and hold shape when around hot water and is resistant to hydrocarbons and solvents. It also has great durability indoors and outdoors and resists a lot of wear and tear during operation use. The natural grade of this type of plastic is 3A sanitary compliant and is also recognized by the FDA, USDA and NSF. The black grade is also FDA compliant. Gears, cams, bearings, rollers, sprockets, guides and weak profiles in domestic and industrial machines. Food applications such as contains, measuring equipment, cooking instruments and food storage. Full data sheets are available on request by fax email or post. Manufactures have lean towards copolymers because they provide a wider processing opening. Acetals are highly crystalline, they must be heated higher than their melting point to be processed. Homopolymers possess a greater degree of regularity in their structure; therefore they are more crystalline than their copolymer counterparts. 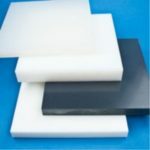 Generally Acetal is used in more industrial suited environments such as fabricated parts for machines it has a good mechanical strength and rigidity and a low moisture absorption rate. It also had a good chemical resistance which is a strong positive when working with other materials and solvents. 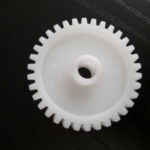 Nylon and Extruded Nylon are often used in food processing machinery components such as gears, rollers and wheels. Nylon plastics have a very high machinability properties and low coefficient of friction as well as being FDA approved.